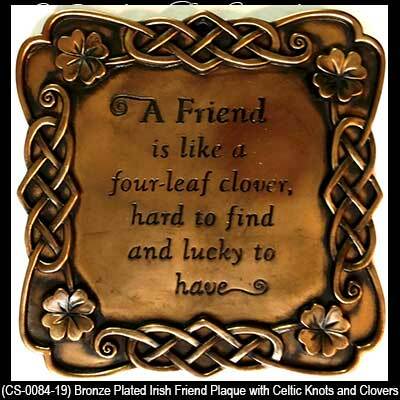 A friend is like a four-leaf clover, hard to find and lucky to have. The Irish blessing plaque is a tribute to a friend and is bordered with Celtic knots and clovers. 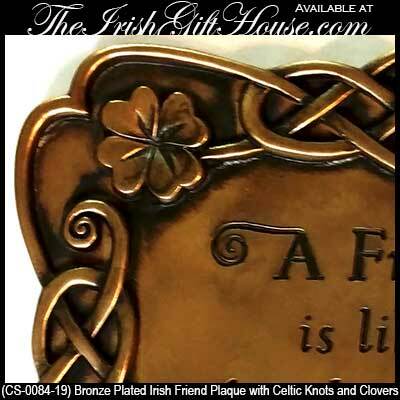 Made of hand crafted, cold cast bronze plated construction, this Irish friend blessing plaque measures 5 3/4" wide x 5 3/4" high x 1/2" deep and has a dimensional design that is ready to hang on your wall. This Irish blessing plaque is made in Ireland by Celtic Shadows and it is gift boxed with a Celtic knot history card that is complements of The Irish Gift House.